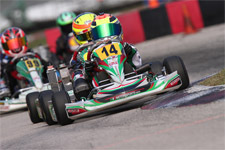 After staking his claim to the 2013 Florida Winter Tour (FWT) TaG Cadet Championship and Rotax Mini Max Vice-Championship to start off his season, Anthony Gangi Jr. would turn his attention to the World Karting Association (WKA) Manufacturers Cup series this past weekend. Taking to the Carolina Motorsports Park (CMP) facility in Kershaw, South Carolina for round two, Gangi Jr. would contest three classes during an action packed weekend. 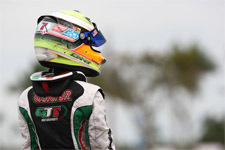 Riding high from his stellar FWT campaign and entering with two WKA victories from round one in Daytona in December, Gangi Jr. would look to continue to put his GT7 Motorsports/Tony Kart on top. With cold, rainy weather clearing out for comfortable temperatures and sunny skies for the weekend racing, Gangi Jr. would take to the track Saturday in Komet Sportsman for the first of his three classes. Clocking fifth quick in the qualifying session, the young gun would maintain his position in the eight lap prefinal. Posting the fastest race lap, Gangi Jr. showed he had the speed to compete. Moving up to third in the final, the Brookville, New York resident claimed his first podium finish of the weekend. Up next for Gangi Jr. was the racy Cadet Sportsman class. Just missing out on the pole position by 0.118 seconds, Gangi Jr. would maintain his off-pole starting place after the prefinal race concluded. Again earning fast lap honors, the WKA Daytona double race winner would earn yet another podium result after coming home fourth in the main event. Gangi Jr. would then wrap up his Saturday with the Yamaha Sportsman division. Taking third overall in the qualifying session, Gangi Jr. would end up starting the prefinal from the tail of the grid after being a half pound light at the scales. 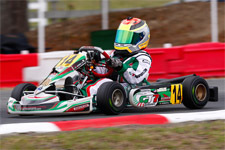 Showing his determination and his fast race pace, he was the fastest kart on the track in the prefinal as he recovered to finish in the top-five. 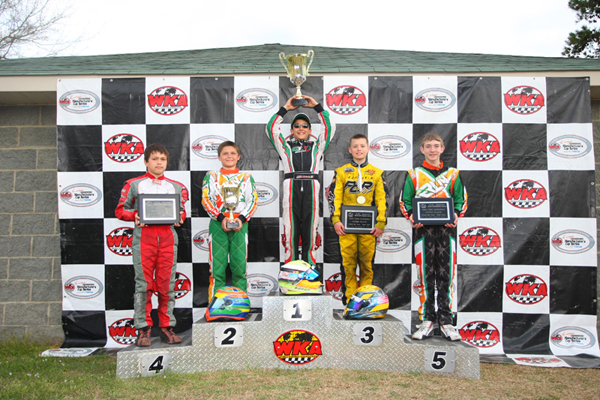 Gangi Jr. was then able to claim his third podium of the day after his fourth place finish in the final. 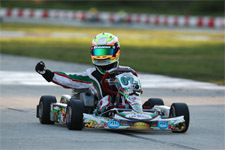 Back on track Sunday, Gangi Jr. would add his third victory to his 2013 WKA Man Cup tally. A slow start in the Komet Sportsman class saw the rising star back in seventh after qualifying. Progressing to fourth in the prefinal, Gangi Jr. was then able to top the blocks in the division during the afternoon podium presentations. In Sunday Cadet Sportsman action, Gangi Jr. started off placing fourth in the morning qualifications and then moved up to third in the prefinal. An ultra-competitive and exciting final race then ensued, as last lap aggressive driving by Gangi and the frontrunners eventually relegated Gangi Jr. down to the eighth place. Closing out his Kershaw campaign, Gangi Jr. would only clock 11th quick in the Yamaha Sportsman division for Sunday's action. 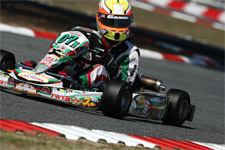 Making quick work of his competition in the prefinal, Gangi Jr. was able to advance up to fourth and then maintained his position in the final to earn yet another podium result. Anthony would like to thank his tuner and driver coach Chris Perez, Mike Doty of Mike Doty Racing and Daniel Woltjer, as well as his karting sponsors Millwork Solutions Inc., Holeshot Drive Systems and PKT Axles. Anthony Gangi Jr. will now enjoy a few weekends off as he next takes on the new United States Pro Kart Series, which kicks off April 26-28 at the Mooresville Motorplex in Mooresville, North Carolina. 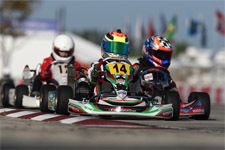 WKA Manufacturers Cup racing continues with round three at the New Castle Motorsports Park May 17-19. The weekend prior, Gangi Jr. and his GT7 Motorsports squad will also compete in the Great Lakes Sprint Series 2013 season opener at the same New Castle, Indiana facility.